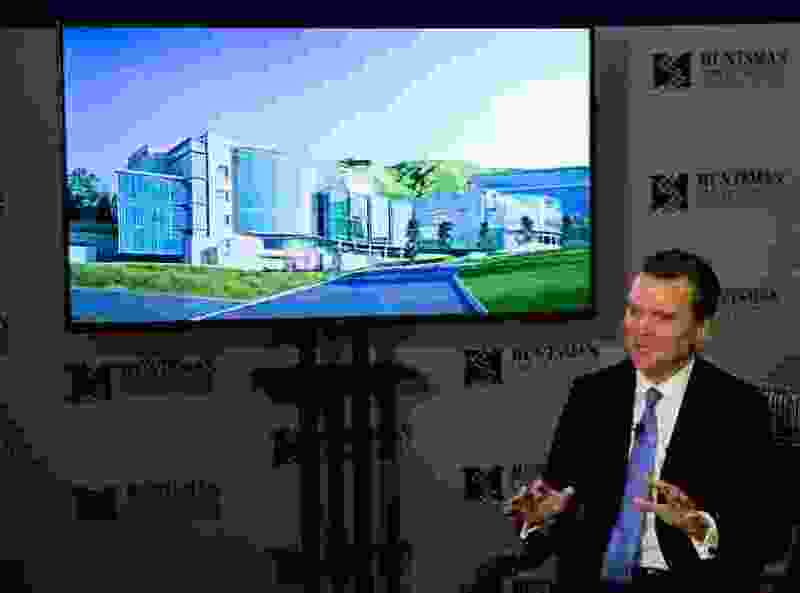 (Jeremy Harmon | The Salt Lake Tribune) Peter Huntsman talks about an expansion of the Huntsman Cancer Institute on Thursday, Sept. 20, 2018. Donors have pledged half the money needed to build a proposed expansion of the Huntsman Cancer Institute at the University of Utah, which officials say is needed to accommodate the growing number of patients seeking treatment there. Huntsman Cancer Foundation chairman and CEO Peter Huntsman announced the $40 million donation Thursday at the foundation’s annual gala. The project must secure the rest of the funding — likely through bonds approved by the legislature — before construction can begin. Donors include Spencer and Kristin Kirk in honor of Kathryn F. Kirk, The Church of Jesus Christ of Latter-day Saints Humanitarian Aid Fund and doTERRA International. The new addition, which Huntsman called phase 5 of the project his parents Jon and Karen started in 1995, is expected to add an additional 100,000 square feet to the institute’s north end. That new space translates to 50 additional inpatient rooms, as well as new clinics, in particular one focusing in women’s cancers, Huntsman said. The space will increase the number of patients served per year from 125,000 to 180,000, Huntsman said. The new expansion will be called The Kathryn F. Kirk Center for Comprehensive Cancer Care and Women’s Cancers a the Huntsman Cancer Institute. Huntsman said this expansion is needed because the institute is typically at capacity, and sometimes patients seeking treatment there have had to go elsewhere because there isn’t enough room for them. (Jeremy Harmon | The Salt Lake Tribune) Mary Beckerle talks about an expansion of the Huntsman Cancer Institute on Thursday, Sept. 20, 2018. 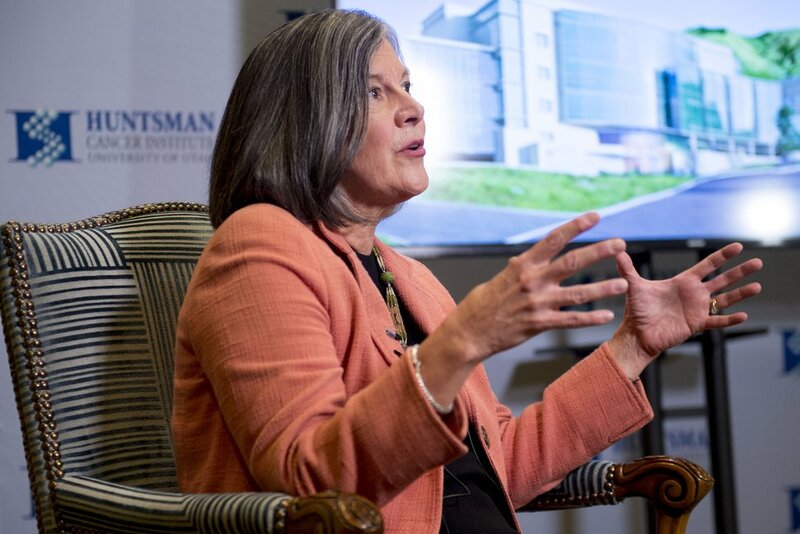 Huntsman Cancer Institute CEO Mary Beckerle, who has been researching cells and cancer for decades, said she wasn’t scared by the growing number of patients needing cancer treatment. In fact, she said this is the “most exciting” time in cancer research that she can remember, because science has advanced to the point where researchers and physicians understand the disease more than they ever have — and that means better patient outcomes, she said. Plus, Utah’s population is growing. That, paired with the institute being the only National Cancer Institute-designated comprehensive cancer center in the mountain west, means demand for treatment there is increasing. And institute officials feel its their duty to meet that need. “We view it as our sacred responsibility to serve not only the people of Utah but also the people beyond Utah in the five-state mountain west,” Beckerle said. The new expansion would mean less space to work with on the University of Utah’s campus, and Huntsman and Beckerle said they’re not sure where they’d put a phase 6 expansion. Perhaps it won’t be needed. Both Beckerle and Huntsman said eradicating cancer was the institute’s goal. If that happens, Huntsman said, the institute would become a world-class hotel. He said Thursday the switch would be seamless because, at his father’s request, the institute was already outfitted with furniture and decor fit for a fancy hotel. The University of Utah Board of Trustees, the state legislature and the university’s building oversight committee must approve the project before it can move forward. If approved on time, construction could begin in December 2019 with the opening in fall 2022, according to a news release from the foundation. Editor’s note: Paul Huntsman, a son of Jon Huntsman Sr., is the owner and publisher of The Salt Lake Tribune.